All you history buffs out there are going to want to clear some space in your calendar and plan a trip to Washington, DC to see an absolutely unforgettable new exhibit! 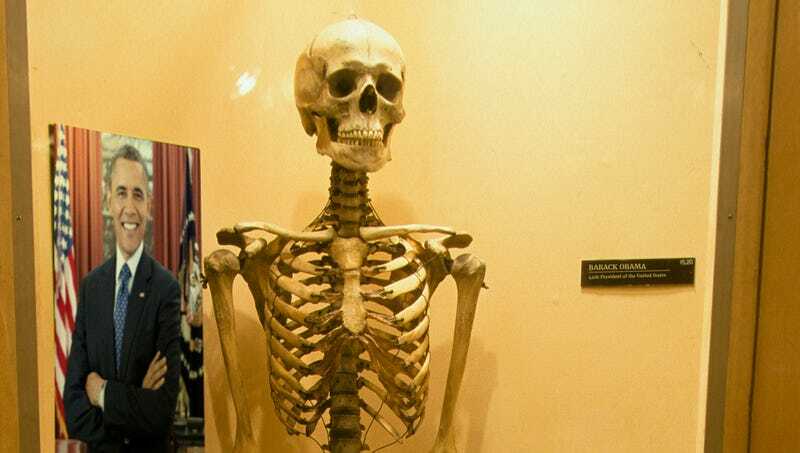 Nearly two years after completing his historic presidency, Barack Obama’s bones are currently on display at the Smithsonian for the first time! This is an incredible opportunity to get a firsthand look at the 44th president’s skeleton up close and in person! As of Monday of this week, the full set of bones of former U.S. President Barack Obama, who served from 2008 to 2016, can be seen at the Smithsonian’s National Museum of American History’s new exhibit dedicated to his life and presidency. Obama’s skeleton, which up to this point had been stored underground in an archive beneath the museum and away from public view, has been fully reconstructed by some of the nation’s top paleontologists, and the display will give visitors the chance to observe for themselves the size and stature of the “Yes We Can” president whose inauguration and presidency still represent hope for much of the country. Seriously, this is not something any fans of American history are going to want to miss. Anybody who can make the trip will not regret taking the time to witness the skeleton of the groundbreaking commander in chief who helped pass the Affordable Care Act and who was in the situation room as Osama bin Laden was brought to justice in 2011. Along with President Obama’s bones, the exhibit also includes a replica of the former president’s Nobel Peace Prize, as well as the skull of his beloved pet dog, Bo. This is pretty much as close as you can get to actually meeting Barack Obama in person! President Obama’s incredible legacy as the first African American president and a progressive icon deserves to be remembered and honored, which is why it’s so awesome that the Smithsonian has made his skeleton available for the world to see for the first time! Be sure to check it out because this exhibit sounds like a must-see!